This article was peer reviewed by Mark Brown, Dan Prince and Bruno Mota. Thanks to all of SitePoint’s peer reviewers for making SitePoint content the best it can be! Developed by GitHub, Electron is a framework that allows you to leverage your web design skills to build slick, cross-platform desktop apps. In this tutorial, I’ll demonstrate how to combine the power of Electron with React, ES6 and the Soundcloud API to create a stylish music streaming app that will stream your favorite tunes right to your desktop. I’ll also demonstrate how you can package the app and distribute it as a portable, OS-specific bundle. This tutorial assumes a basic knowledge of React. If you’d like a primer before you begin, check out our getting started tutorial. The code for this tutorial is available from our GitHub repo. We will use React to create the UI, the SoundCloud API to get the tracks, and Electron to allow the app to run in a browser-like environment. As you can see, it will have a search field for searching for the music to be played and the results will be the audio players for each of the results. Pretty much like what you see on the SoundCloud website. If you want to follow along make sure you have a SoundCloud account and a SoundCloud app. Take note of the API key because we will use it later. electron-prebuilt —installs Electron prebuilt binaries for command-line use. babel-preset-es2015—used for transforming ES6 code to ES5 code (which can run in any modern browser). babelify—the Babel transformer for Browserify. browserify—builds a bundle you can serve up to the browser in a single <script> tag. node-soundcloud—allows us to make calls to the SoundCloud API. react—the React library. Allows us to create UI components. react-dom—allows us to render React components into the DOM. react-loading—used as a loading indicator for the app. react-soundplayer—a React component that allows us to easily create custom audio players for SoundCloud. Once you’ve added the dependencies and devDependencies, execute npm install to install all of them. Finally, add the scripts for compiling and starting the app. This will allow you to run npm run compile to compile the app and npm start to run it. While we’re at it, we can remove the electron-quick-start-specific stuff and add sensible defaults of our own. "compile": "browserify -t [ babelify --presets [ react es2015 ] ] src/app.js -o js/app.js"
All in all, your package.json file should now look like this. When main.js creates the new browser window, it will load index.html (we’ll look at this file later on in the tutorial). From here, the app will run in the same way as it would in a browser window. Next let’s create the Track component for the audio player (in src/components/Track.js). Note that by using this syntax we are effectively extracting the Component class from React. As the name suggests, Component is used for creating new components. Then we create a new component named Track and give it a render method. Note that we’re exporting this class so it can be imported into another file later on. Inside the render method we extract the information about the current audio track from the props it received and then assign them to their own variables using destructuring assignment. This way we can use track instead of this.props.track. And return the UI of the component. As you can see from the above code, we have a pretty standard audio player. It has a play button, a timer (which shows the current play time/duration), the title and username of the user who uploaded the song, and a progress bar. Here’s what the complete component looks like. Let’s move on to the ProgressSoundPlayer component (src/components/ProgressSoundPlayer.js). This will serve as the wrapper for the Track component created above. Aside from React and the Track component, we also need to import the SoundPlayerContainer. The SoundPlayerContainer is a higher level container that propagates its children with the props they will need to build the audio player. Next up, we’ll create the ProgressSoundPlayer component. All this does is render the SoundPlayerContainer which wraps the Track component. Note that we do not need to pass anything to the Track component since SoundPlayerContainer automatically does this for us behind the scenes. We do however, need to pass the resolveUrl and clientId as props for the SoundPlayerContainer. Finally we specify the props required by this component. In this case we require the resolveUrl and clientId to be passed in when this component is rendered. Specifying the propTypes is a good practice to get into. This will trigger warnings in the dev tools console if the props that the component requires don’t get passed to it. Note that we didn’t have to do this earlier in the Track component since the SoundPlayerContainer is responsible for passing in all of the necessary props. The main file is src/app.js. This is responsible for rendering the full UI of the app—that is the search field, and the audio players. Breaking the code down, we first import all the libraries that we need. Each of these were mentioned earlier in the dependencies section (except for the ProgressSoundPlayer which we created). Note that you can use something like dotenv so you won’t have to push this piece of data to your repository. Initialize the node-soundcloud library by supplying an object containing your SoundCloud client ID. Inside the class, define the constructor method. This allows us to add code for initializing this class. Inside the constructor method we then call super() to call the constructor of the Component class and any initialization code that the Component class has. Then comes the handleTextChange method. This is used for updating the value of query in the state and also calls the search method if the Enter key is pressed. This method gets called when the onKeyUp event gets fired on the search field. After that we have the search method, which sends the query to the SoundCloud API and processes the response. First it sets the isLoading state to true so that the spinner becomes visible. Then it makes a GET request to the tracks endpoint of the SoundCloud API. This endpoint accepts the query as its required parameter, but we also pass in an additional embeddable_by parameter to specify that we only want to fetch tracks that are embeddable by everyone. Once we get a response back, we check if there are any errors and if there aren’t, we update the state with the search results. At this point the component should now re-render to show the search results. The render method renders the UI of the component. This contains a search field for entering the song name or artist and a button for submitting the search. It also contains a couple of conditional statements for rendering the Loading component (which only becomes visible when isLoading has a truthy value) and the search results (which are only displayed when hasResults is truthy but isLoading is falsy). Next, we have a method that gets called by default since there are no search results when the component first gets rendered. And the method that is called when there are search results to display. This calls the map method in the searchResults to loop through all the results and execute the renderPlayer function for each iteration. Finally, we render the component into the DOM. The styles for the app reside in css/style.css. The stylesheet contains style declarations for each of the components (play button, search button, progress bar, and other elements that we’ve used). And Electron will happily run it for you. You can run the app by executing npm start in the root of your project. But that wouldn’t be any fun at all. You might as well just run the app in the browser and call it a day. Instead, what we’ll do is to package the app into a single folder. That folder will contain all the files necessary for the app to run. You can then create an archive from that folder to distribute your app. 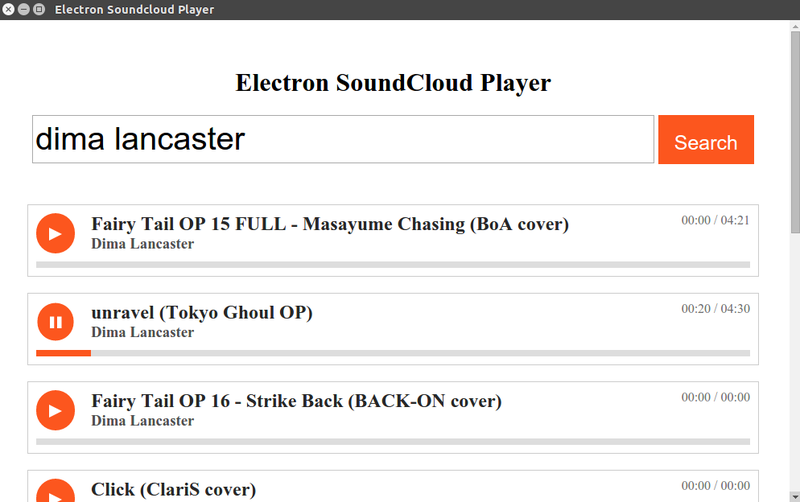 electron-packager ./soundcloud-player SoundCloudPlayer --version=1.2.4 --platform=linux --out=/home/jim/Desktop --arch=all --ignore="(node_modules|src)"
--version=1.2.0—the version of Electron that you want to use. It’s at version 1.2.0 at the time of writing of this article, so if you’re reading this at a later time, you can probably use the latest version as long as there are no breaking changes in the API. --platform=linux—the platform where you want to deploy to. In this case I used Linux since I’m on Ubuntu. If you want to package for all major platforms (Windows, OSX, Linux) though, you can use the --all option instead. --out=/home/wern/Desktop—the output directory. This is where the package will get created. --arch=all—the processor architecture. We’ve specified all which means it will build for both 32-bit and 64-bit operating systems. You can read more about electron-packager on the project’s homepage. You can read up on the other available command line arguments in the documentation. Add a function to automatically stop a playing track once the user searches. Remove the button and call search directly from the handleTextChange method. Package the app to an asar archive to avoid exposing your source code to everyone. If you’re serious about distributing your app to the whole world. You can create an installer for all major platforms (Windows, OSX, and Linux). There’s a project called electron-builder which allows you to do so. To find more inspiration, check out the SoundNode app—an Open-Source project to support SoundCloud for desktop Mac, Windows, and Linux. NW.js—previously known as node-webkit. Allows you to call node modules directly from the DOM. If you’re looking for Electron alternatives, you might want to check this out. Create Cross-Platform Desktop Node Apps with Electron—a recent SitePoint tutorial. In this tutorial we’ve learned how to create a sleek and stylish cross-platform application using Electron. What’s better is that we’ve done this by leveraging our existing web dev skills. We’ve also seen how easy it is to package and distribute this app as an OS-specific bundle. I’d love to hear about the applications you build with Electron in the comments below.